Around this time last year, we were kicking around a few ideas for content and Paul Snyder came up with the idea of coming up with a new gimmick in track and field. The beer mile has become too mainstream so we decided that blue jeans were some clean family fun. The Blue Jean Mile exploded. 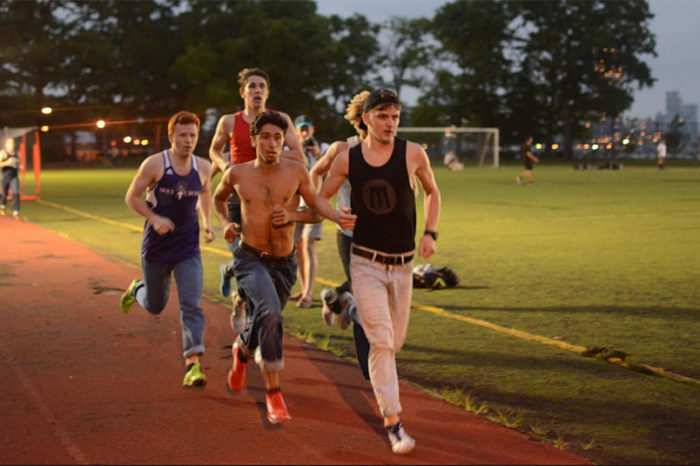 We hosted a mile race in New York City in July. The Sir Walter Miler included it in its program for their night of races in August. We saw the world record from from 5:17 by Ryan Sterner to 4:11.80 by Utah State’s Dillon Maggard. It even got a mention on SportsCenter. As the originators of the Blue Jean Mile, we decided to set an official time frame for when we’d accept Blue Jean Mile times. More than 50 people submitted times last year and we think that it might get even bigger this year. Blue Jeans Mile season official starts on Memorial Day and runs until Labor Day. We did this because we thought there would be a Division III school that would show up to their conference cross country meet in jeans, if we didn’t stop it. So while it’s not officially Blue Jeans Mile season, this delighted us in our email inbox. If you start to see kids running a mile in blue jeans in their P.E. classes in Illinois, it’s totally normal. Major props to Mr. Rebora’s enthusiasm here. Paul is now a writer at Runner’s World but his legacy here at CITIUS MAG lives on.